Batch PSD to JPG 1.51 released. With this version, you can also do a batch resize and rename converted images. Added options in batch renaming the output images according to your preferences. Batch PSD to JPG is a free batch Adobe Photoshop PSD image to JPG image converter. A design tool for converting psd design or flatten multi layer psd design to jpg images with quality that you can set based on your preferences an requirements. Make a list by adding psd from a folder at once, single or multiple psd located in different folders or just drag selected psd from the explorer. Rearrange the list sort order as you wish, set the output folder and the jpg compression then you ready to do a batch convert psd to jpg. While working with the list you can do an instant preview of the selected psd by doubleclick or select preview in context menu. 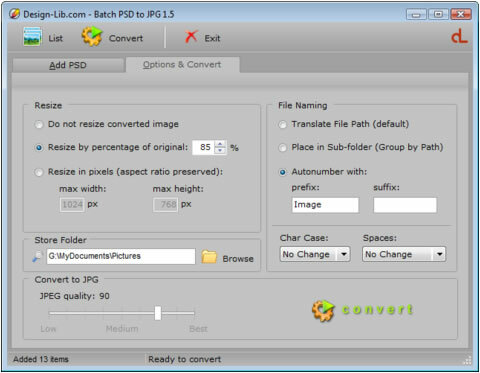 Beside batch convert, this program also allow you to do a batch resize of the converted images. You can resize by percentage or custom pixels width or height. You have many options in batch rename the output jpg images, autonumbering with prefix and suffix, change the filename into lowercase or UPPERCASE and replacing spaces with - or _. If the list made of psd from different folders it is possible to group the output images in a different sub-folder. Always Be Sure to Download from The Trusted Site !